WASHINGTON (AP) — A new U.N. investigation into allegations of war crimes in Sri Lanka will intensify international pressure on its government and could probe the purported responsibility of senior Sri Lankan officials with U.S. ties. As many as 40,000 civilians may have died amid government shelling in the final five months of the conflict in 2009, according to a previous U.N. report. Government forces have also been accused of executing ethnic Tamil rebel leaders who tried to surrender. The government denies its forces targeted civilians or committed serious abuses in defeating the Tamil Tigers’ 26-year rebellion for an ethnic homeland. But the allegations could prove worrying to the ruling circle of President Mahinda Rajapaksa, notwithstanding his tightened grip on power at home in the five years since the fighting ended. In particular, one of his brothers, Defense Secretary Gotabhaya Rajapaksa, who is a U.S. citizen, has been dogged by allegations that he ordered rebel leaders killed. A recent report by a South African human rights lawyer also examines what Kohona knew of a purported surrender deal and the role of a senior military officer, who now serves as Kohona’s deputy at the U.N.
Foreign diplomats say that in the final two days of the war in May 2009, the Tigers’ top two political chiefs, Balasingham Nadesan and S. Pulidevan, had expressed a desire to surrender — a message diplomats conveyed to Sri Lankan leaders — but ended up dead. Six months later, victorious army chief Sarath Fonseka told a Sri Lankan newspaper that the defense secretary had ordered the commander of the army’s 58th Division, which pressed the final offensive, to kill rebel leaders attempting to surrender. Fonseka, who emerged as an opposition leader after the war, said he was misquoted, but was still sentenced to three years in prison for his comments under harsh emergency laws in a 2011 trial. He was freed in 2012. 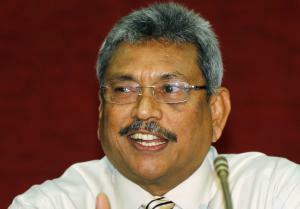 Gotabhaya Rajapaksa is a decorated Sri Lankan army officer who migrated to the U.S. in the 1990s and worked in information technology before returning to his homeland in 2005 to support his brother’s election as president. Although residing in Sri Lanka, as a U.S. citizen he could potentially face prosecution under a U.S. war crimes statute. The Department of Justice declined to comment whether it has investigated the possible involvement of U.S. citizens in war crimes in the South Asia nation. The statute, passed in 1996, has yet to be used. It’s unclear whether the 10-month U.N. investigation will examine Rajapaksa’s actions or those of other individual Sri Lankan leaders. But rights activists are pushing for just that. Abuses by the Tigers, who were internationally proscribed as a terrorist group and reportedly used civilians as human shields, will also be scrutinized, but since the rebel leadership is missing or dead, they have little to lose. The government is refusing to cooperate with the 12-member investigative team, which will be advised by former Finnish President Martti Ahtisaari, a former U.N. special envoy to Kosovo who won the Nobel peace prize in 2008; Dame Silvia Cartwright, who served as a judge on a U.N.-backed tribunal of former leaders of Cambodia’s Khmer Rouge regime of the late 1970s; and Asma Jahangir, former chief of the Human Rights Commission of Pakistan. The investigation is unlikely to lead to judicial proceedings any time soon. It was opposed by Russia and China, whose assent would be needed for any referral to the International Criminal Court. But its conclusions could crimp the international space for any Sri Lankans implicated in abuses. Several U.S. lawmakers have urged restrictions on the entry into the United States of any Sri Lankan responsible for war crimes. A recent report by South African lawyer Yasmin Sooka examines alleged killings and disappearances of more than 100 Tamils in so-called “white flag” incidents at the end of the war. Sooka previously served on an U.N. panel of experts on Sri Lanka. In particular, Sooka’s Johannesburg-based Foundation for Human Rights probes the communications between Nadesan and Pulidevan, foreign and Sri Lankan intermediaries, and government officials in the final 48 hours as the rebel leaders sought to surrender. It concludes that available evidence indicates “an organized government plan at the highest level” to execute rebel leaders in violation of international humanitarian law. The report cites four unnamed eyewitnesses as saying Nadesan and Pulidevan gave themselves up to Sri Lankan forces among a group of 12 people holding white flags after dawn on May 18, 2009. One witness said the group was received by Maj. Gen. Shavendra Silva, the commander of the army’s 58th Division. An hour later, the same witness saw the leaders’ corpses at a roadside, surrounded by soldiers taking photos. Pictures of the lifeless bodies, with burn marks on their torsos, later appeared online. The U.S. State Department reported to Congress in October 2009 that an unnamed Tamil witness who later escaped the area said the Sri Lankan army started firing machine guns at the surrendering group, reportedly killing all of them. The Sri Lankan government has said the leaders were killed in combat, but has given contradictory accounts of how that happened. Rajapaksa has said they may have been shot in the confusion of battle by Sri Lankan forces; Kohona has previously said they were shot in the back by rebel fighters. Silva, who now serves as Kohona’s deputy at Sri Lanka’s mission at the U.N., did not respond to a request for an interview with AP. Kohona distanced himself from earlier comments, now saying he doesn’t personally know what happened. He confirmed that he sent text messages to a European intermediary with advice for the rebels on how to surrender, but he said he was not aware of a surrender deal. 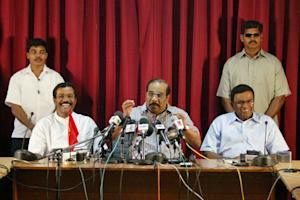 He said he does not believe a kill order was issued by Rajapaksa and executed by Silva. “It is very easy to make allegations. It’s very easy to find witnesses among those who have an ax to grind. But as to whether these carry any credibility is a different matter,” said Kohona, a former attorney in Sri Lanka’s supreme court.